2. Statement showing the details of NSC– such as number, amount and the date of certificate and the circumstance attending such loss, theft, destruction, mutilation or defacement. 3. Bond of Indemnity – In case of mutilated or defaced certificates, no indemnity bond is required. But for lost, stolen, destroyed, you also need to submit bond of indemnity. You also need to furnish an indemnity bond in the prescribed form with one or more sureties or with a bank guarantee is required. This form is used for issuance of a duplicate National Savings certificate(s) in lieu of lost, misplaced, spoiled or mutilated certificates. This bond of indemnity is to be executed for the issue of a duplicate certificate(s) in lieu of lost, misplaced, spoiled or mutilated certificates with a Bank guarantee. This bond of indemnity is to be executed at the time of discharge of original certificates or Issue of duplicate certificate(s) in lieu of lost, misplaced, spoilt, destroyed, defaced or mutilated certificate (s), where original application for purchase is missing. 4. Copy of FIR – If the Certificate is lost, stolen, destroyed. 5. Identification Document of Surety – e.g. Valid Indian Passport, Indian Driving License, Salary Certificate of the Surety. 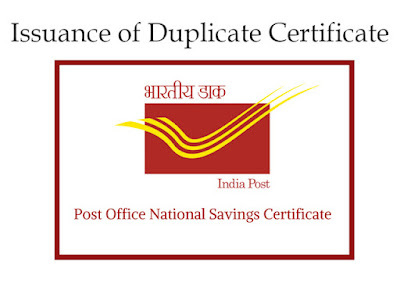 If the officer-in-charge of the post office of registration is satisfied of the loss, theft, destruction, mutilation or defacement of the certificate, he shall issue a duplicate certificate on the application. A duplicate NSC certificate shall be treated as equivalent to the original certificate for all the purposes of these rules except that it shall not be encashable at a post office other than the post office at which such certificate is registered without previous verification.